Do we celebrate often enough? I do not believe we do. It was with enormous pleasure (and some trepidation) that I took a train to York last week to meet many friends I had not seen since I left school many years ago. With my father being in the RAF and due to go abroad to Germany, I was sent away to boarding school in Whitby, North Yorkshire at the age of 11years. To cut a very long story short, I had five very happy, fairly spartan years there, but years that moulded me and gave me so much, not necessarily in education but an awareness as to the feelings of others, some wonderful friends, a good Protestant work ethic and a well developed sense of guilt! All that aside, I feel very fortunate to have been a St. Hilda’s girl – can you spot me?! The people running the school were a Church of England group of nuns with their mother house in Whitby. This year, 2015, was their centenary year since the start of their community in 1915. Well worth a celebration! 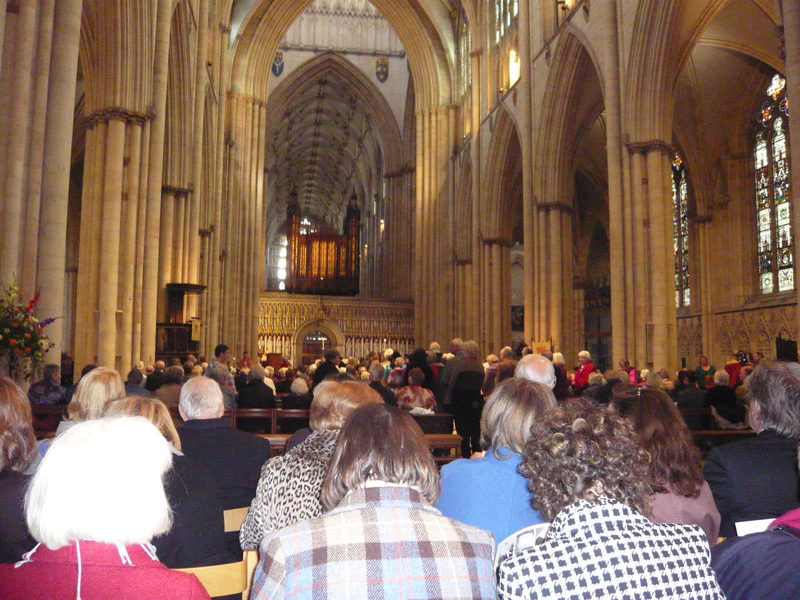 All the ‘old girls’, pupils from the school, were invited to join the celebration in York Minster, with the Archbishop of York taking the service – a man with a great sense of humour. There were over 600 people attending, many had travelled from all over the world, as the Order ran many schools and organisations in Africa and other places over the years. I and a group of around 16 of us from our year met first for coffee – how to describe recognising people you have not seen for so long – quite mind blowing. But, sitting down, coffee in hand, it was all as if it were yesterday! 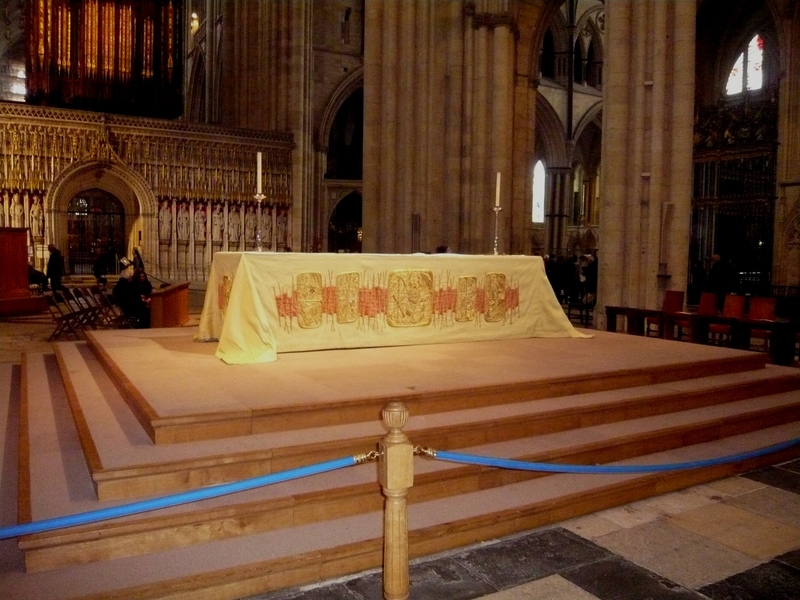 However, my great friend from school days suddenly caught sight of the altar cloth. Her mother, an exceptionally talented embroideress, had helped design and make it nearly 40 years ago – there it was looking as beautiful as ever – could there have been a greater coincidence! It was a very special day – as one friend put it, it was a celebration that cemented enduring friendships as well as commemorating a very happy youth. This is some of the advice Bill Gates gave in a high school speech about 11 things that they will not learn in school. He spoke about how feel-good, politically correct teaching created a generation of children with no concept of reality and how this set them up for failure in the real world. Rule 2: The world will not care about your self-esteem. The world will expect you to accomplish something before you feel good about yourself. Rule 3: You will not make $40,000 a year right out of high school. You will not be a vice-president with a car phone until you earn both. Rule 6: If you mess up, it is not your parent’s fault, so don’t whine about your mistakes, learn from them. Rule 7: Before you were born, your parents were not as boring as they are now. They got that way paying your bills, cleaning your clothes and listening to you talk about how cool you are. So, before you save the rain forest from the parasites of your parent’s generation, try delousing the closet in your own room. Rule 8: Your school may have done away with winners and losers, but life has not. In some schools they have abolished failing grades and they will give you as many times as you want to get the right answer. This does not bear the slightest resemblance to anything in real life. Rule 9: Life is not divided into semesters. You do not get summers off and very few employers are interested in helping you to find yourself. Do that in your own time.